MacD is a Melee smasher from Southern California who mains Peach who is currently ranked 48th on the 2017 SSBMRank and was formerly ranked 8th on the SoCal Melee Power Rankings. He is considered to be one of the best Peach mains in the United States, with wins against top players such as Mango, PPMD, Axe, SFAT, Plup, Westballz, Lucky, and MikeHaze. 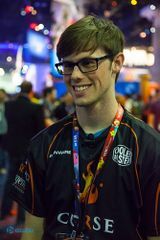 He is a frequent streamer on Twitch, and does overnight streams where he answers questions and talks to playing partners. From April 29th to August 21st, 2014, MacD was the manager for Team Curse's Smash Bros. division. On August 24th, 2015 MacD and Nintendude joined FolloweSports.com, which was re-branded to Splyce on December 2nd, 2015. He ended up leaving Splyce on March 3rd, 2018. MacD used to organize a monthly tournament series called Mayhem. R3 December 19th-20th, 2009 9th 1st ? This page was last edited on January 14, 2019, at 17:05.